simple things and making them come out so funny. Who couldn't love Foghorn Leghorn? "That dog's as subtle as a hand grenade in a barrel of oatmeal." chickenhawk who really didn't know what a chicken was. the love of his life, Miss Prissy. for any emergency that would arise. after Sylvester, who is already having trouble with the dog. either of them. 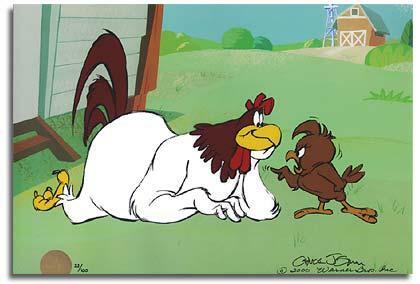 Foghorn and the cat beat each other up. Miss Prissy that Henery Hawk is a chicken hawk. Now cu, I say cut that out, what's it all about boy, elucidate! up. Now try again boy. Kids nowadays they kmnow it all. Oh that woman. Gotta mouth like an outboard motor. Go away boy, ya bother me. I keep pitchin' em and you keep missin' 'em. Ya way off, I say ya way off this time son. That boy's as strong as an ox. And just about as smart. Pay attention to me boy. I'm not talkin' just to hear my head roar. No no no, ya doin' it all wrong. She re, I say she reminds me of Paul Revere's ride. A little light in the belfry. Now wha, I say what's the big idea! This is gonna cause more confusion than a mouse at a burlesque show. That boy's about as sharp as a bowlin' ball. flap a skirt in a high wind. I almost had a gag son. Joke that is. Go, I say go away boy ya bother me. funny son and your not laughin'. That dog, I say that dog is lower than a snake full of buckshot. sody pop. Huh huh huh huh huh. Watch it fizz. That boy, I say that boy's just like a tatoo. Gets under your skin. Don't, I say don't bother me dog, can't ya see I'm thinkin'. Any of this getting through to ya son? that boy's forcin' me to use stronger measures. What's, I say son what's gimmick? What's it all about? Well, hog gravy and chitlins's! Nice kid, but a little dumb. flappin' but no noise is coming outta your big mouth! could warp his mind for life. What's goin', I say what's goin' on here? Go away boy ya bother me. I've got work to do. Now look a here son, you're not doin' that right. Gimme that boy, I'll show ya how. Better start with somethin' mild. He looks a little puny. Oh no! I don't believe it. I gotta get a worms eye view of this. ya gotta know how to handle it, one wrong move and you're done for. There ya are sister, have fun. Now hold on, that was a joke girl. I'm not one to stand by and let a lady do a man's job. gotta teeeze 'em a little. Make 'em chase ya. Dog: Well with that puss your only chance to get a rooster is to trap one. Prissy: Woohooo, he's chasing me. I need your love to keep me warm. what she'll do to me. still got a couple of tricks up my sleeve. Smart boy, got a mind like a steel trap...full of mice. skeletons throwing a fit on a tin roof. Boy, she's the original dumb cluck. When it comes to brains, she missed the bus too. Well when, I say, when ya gotta go, ya gotta go. Scared? Who, me? Course I'm not scared! Hmmm, I better play it cagey. Now who's responsible for this unwarranted attack on my person? Make way for the King of the Road! Yahoo! Like beating a dead horse...he's got no get up and go. Pay attention, boy. I'm cutting but you ain't bleeding. Adios you chicken-plucking little stinker!